You are here: Home / Jyotish Gemstones and Talismans / Spiritually empowering energies in this Rich Canary Yellow Colored fully Natural Yellow Sapphire for the best gifts of the largest planet in the solar system and the most benefic planet – Jupiter! Spiritually empowering energies in this Rich Canary Yellow Colored fully Natural Yellow Sapphire for the best gifts of the largest planet in the solar system and the most benefic planet – Jupiter! 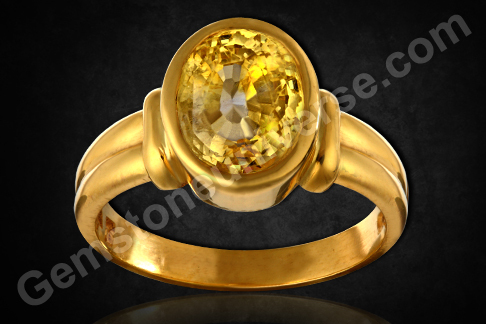 Comments The striking rich canary yellow color of this fully natural and untreated Yellow Sapphire from the Ratnapura mines of Sri Lanka are filled with spiritual energies that instantly soothe the soul! Through each of its fine facets spring out a Sattvik aura that instantly gives out the feeling of power! With a wonderful oval cut, this gem set in a 22K gold ring is making a Jupiter talisman to get the best of the spiritual and material worlds! 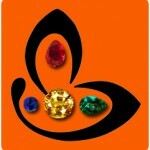 A Jyotish talisman that will ensure best results! Classified as Entry Level when listed first, one look at the lustre and you need to question again- Is this entry level Jyotish Quality? The Navratnas or the nine sacred Gemstones each belonging to the divine nine planets besides having planetary benefits have a profound and positive impact on the chakras- the energy centres of the Body. The Yellow Sapphire also known as Pukhraj is the Gemstone of Jupiter has a positive impact on the throat chakra also known as the Vissudha Chakra. This website makes tghnis hella easy.